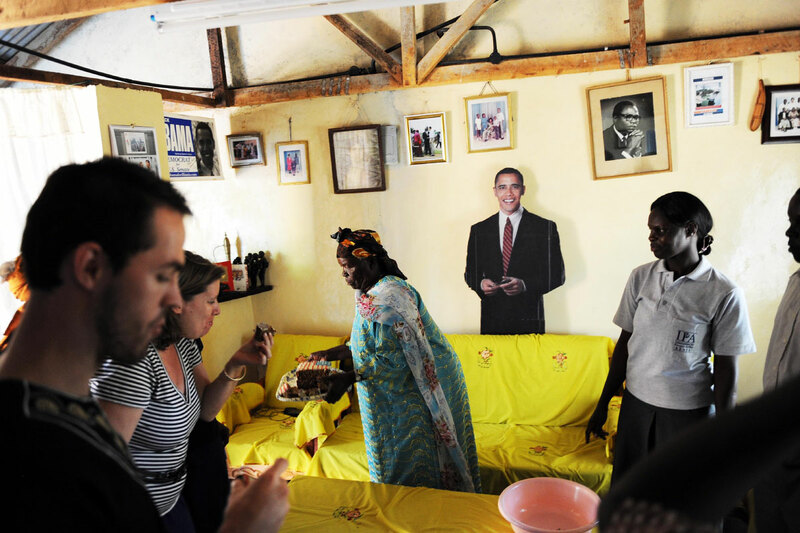 "Mama Sarah" Obama, the paternal grandmother of U.S. president-elect Barack Obama, serves a US-flag-decorated cake that was brought to her by one of her many visitors at her home, the hometown of the incoming president's father, Barack Obama, Sr. While things in the village are changing for the better - such as the influx of electricity and running water - the Obama family has to deal with it's newfound fame in connection with being related to the incoming US President. There are few places the family can travel without being recognized and approached. Streams of visitors pass by the home of "Mama Sarah," and no longer can she regularly visit the market where she, for years, chatted with friends while selling goods. A life-size likeness of the incoming U.S. presidents stands near a portrait of his deceased father.